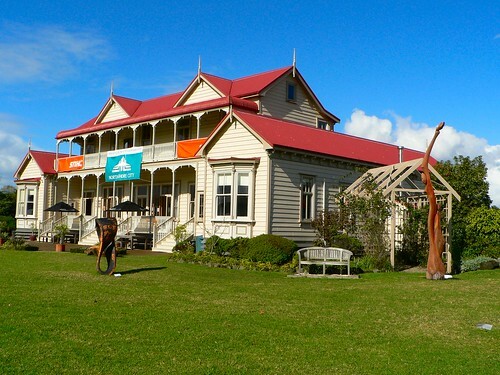 Visit the Lake House Arts Centre in Fred Thomas Drive, Takapuna. In a beautiful garden setting (formerly the site of the Barry’s Pt tip), which often has fantastic outdoor sculptures, the Lake House is a fine example of Victorian and Edwardian architecture, preserved and lovingly maintained by a charitable trust. It was a boarding house in earlier times, built at the northern end of Takapuna Beach and was moved to its present site in the late 1990s. You can visit the Lake House galleries to enjoy the rich variety of artworks on exhibition, you can join an art class for a term or more (adults and children’s classes are offered), or enjoy breakfast or lunch at the on-site cafe, amidst this wonderful piece of North Shore heritage. Perhaps you’d like to book your kids into a school holiday programme. Check out the timetable here. This is just a query. A small group of us are to be meeting for coffee at the café on Tuesday 22nd November. One of us has a very small dog she would like to bring with her – is this permissible inside or out?